Jonathan Wren, Sean French and John Hodnett at Irish Independent Park. Image credit: Munster rugby. Noel McNamara's side will host England in Cork on the opening weekend of the tournament, Friday February 1 before welcoming France on Friday March 8. 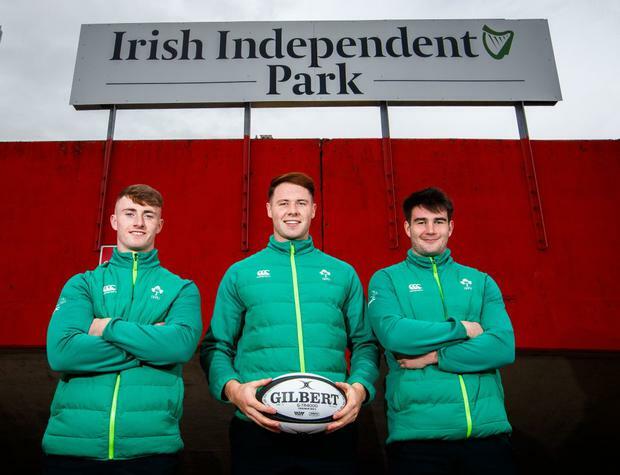 Ireland have been playing their home games at Donnybrook Stadium, now Energia Park, in the last numbers of years and this will be the first time that U20 Six Nations games will be held in Irish Independent Park, which has recently installed a 4G pitch. 2018 was Noel McNamara's first year in charge of the Ireland U20 team, as they finished in third in the Six Nations. Ireland came out on top against both Italy and Wales before falling in tough battles to France, Wales and England. Micheál Ó Scannáil A late Tommy O'Brien try ensured that Ireland secured their place in next year's World Rugby U20 Championship after seeing off the brave challenge of Japan.